Yup, that's right... we've got our second award! 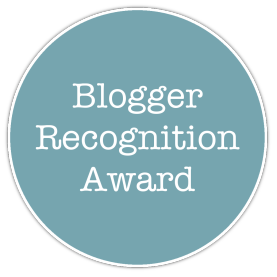 This time it's the Blogger Recognition award and we were nominated by the lovely blogger from http://itsnira.weebly.com/. Please check her blog out, she's such a lovely person and you won't be disappointed! Onto the rest of the post! We started blogging in 2015, mainly because me (Aleeha) and Lucy were bored! I suggested starting a blog and so we ended up creating 'a blog by 4 best friends' on February 2nd 2015 with our other two best friends, Holly and Eleanor. Since then, not only has the blog grown, but it has also changed quite a bit. The blog is basically just a blog by me and Lucy now. I usually write the majority of the posts that go up whilst Lucy creates any graphics, does any blog design related work and also a lot of the work behind the scenes that can sometimes go unnoticed, but is just as important! My first piece of advice is to just be yourself... no one wants to find themselves reading a blog that's just like another blog! What's the point in that?! It can take a while to find your blogging style, but once you find it, just stick to it because there isn't any point in writing about a certain topic when it's not something you're interested in! My second piece of advice is to make sure you're a 'lovely blogger who's part of the blogging community'. No one is going to notice your blog if you don't comment on other blogs and use social media to promote your own posts! However... please don't go commenting on other people's posts just to use them as a way to advertise your own blog! Trust me, a lot of hard work gets put into those posts! If you want to link your blog then just link it at the end of your comment... people can click on it if they wish, but that should not be the purpose of your comment! These are the 15 bloggers we have decided to nominate... sorry if you've been nominated before! Congratulations to everyone who got nominated and sorry if we haven't nominated you... we would nominate all the bloggers reading our blog if we could, but unfortunately 15 is the maximum! Thank you SO SO SOOOO much for 300 followers by the way! 300 is a pretty big number to us... that's more people than there are in our whole year group at school. It's crazy how much this blog means to us and it's all thanks to you!